I am under so much pressure. But we’ll get to that later. Let’s start at the beginning. 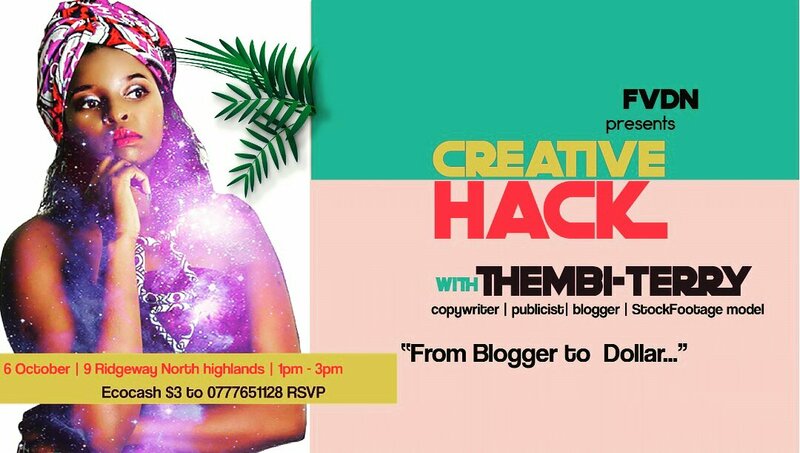 The Female Visual Digital Network will be holding the first ever Creative Hack for female creatives and I have been selected to be one of the speakers at this event. What will you be speaking on? So my topic is pretty cool, it’s “From Blogger to Dollar.” This is a hot topic for content creators in Zimbabwe we want to know where the money is and how to get it. As a blogger I have made the money in several ways. I had to get creative though and you’ll need to attend the event to hear all about it. No sneak peeks or spoilers here. What qualifies you to speak on this matter? Is this even a serious question? But because when I part with money to attend an event these are the kind of things that I wanna know I’ll humor you. I’m known for many things in these streets but being a blogger is the one that sticks out the most. I have blogged for 4 years. I have done freelance work for publications such as Divas Inc, Kalabash Media, and plenty others. I work in advertising in the day time, meaning I know what brands are looking for and how to give them value for money as a content creator. A little bit of everything, yes including my signature silliness. Silliness is always on the menu. I haven’t completed my presentation but ideally I’d like to mesh my personal experiences with some tips and tricks that I have come to prove to be effective. I’m not gonna razzle dazzle you with some things that I have never tried before. It’s gonna be a practical session so as my mentor Thembe Khumalo likes to say, “Bring dreams.” I’ll take time during the event to do one-on-one sessions to advise you about your specific idea and how you can grow it effectively. The fiery Phroetiq will be speaking at the event as well. I have followed her on these social media streets for years and have come to learn a thing or two from her. Last year when I went to pitch at the Shoko Festival Hub Unconference she had coached me and given me valuable tricks to nail it. I am excited to hear what she has to share because her mind is brilliant. Her CV/Resume tips are just one of the initiatives that she started amongst other ones that I feel are innovative, different and brave. Events such as these are important for idea sharing. I can’t tell you the number of events that I have attended but I can tell you that each of them taught me something new. I am putting myself through the ringer to bring you an insightful presentation because I too hate to have my time wasted. I usually turn down speaking engagements but this one is something that I truly believe in.